Edenlandia | Cosa Mi Metto??? Luca and I decided to go to the Edenlandia lunapark in Naples for a good cause: the gain of the whole day will go to charity to the children of the Santobono hospital. It was funny to go back to childhood for a while!!! Luca ed io abbiamo deciso di andare al lunapark Edenlandia a Napoli per una buona causa: il ricavato dell'intera giornata andrà in beneficenza ai bambini dell'ospedale Santobono. E' stato divertente tornare bambini per un pò! Don't forget to enter this wonderful giveaway.. Non dimenticate di partecipare a questo fantastico giveaway..
Que divertido!!!! Vas guapisima y comoda, para mi un 10!!!!! I love your outfit! So pretty! Beautiful place! Wow!! Lovely outfit and pictures!! I follow you now!! I loved the outfit, highlight the vest, which pretty! Bellissime foto!!! !e il gilet è una favola!!! Thank you for the comment on my blog. I love your hair it's so beautiful! I would like to follow your blog, If you follow my. aww another lovely post from you. 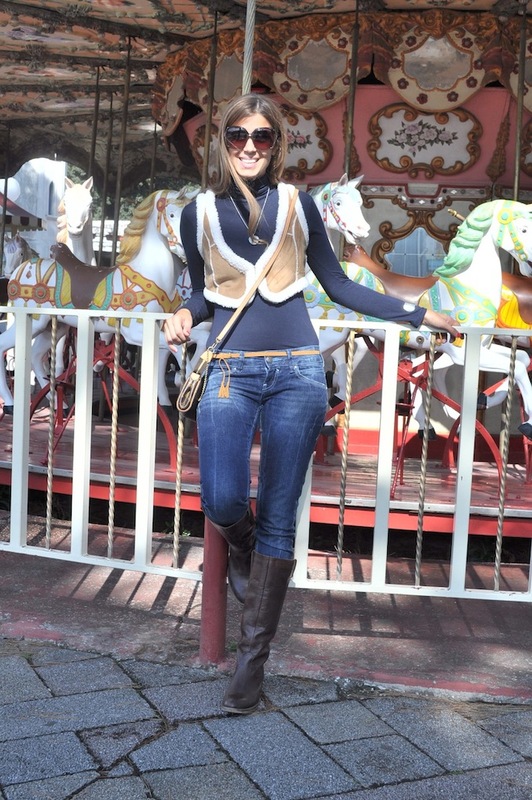 love the carousel background so much and your outfit as well!! I'm really enjoying your blog. I like your look. Kisses. Great vest darling. Hope you´ve had a great time. I´m already following you, and as you said, would love if you could follow me back to share eachs others blog. Amazing blog and great pics! !, thanks for your comment, I follow you!! Lovely look! I really love your sunnies! What a fun post! You look FAB! This looks so fun! I really love the vest! bellissimo post. Io adoro le giostre con i cavalli! I love the waistcoat!!! it´s retro style! I had one when I was 8 years old! I love it! Seems like a nice time! Hey, thanks for the comment! I am a follower of your amazing blog for a long time. Will you follow my blog back? ma che bel posto :) bello il tuo outfit! What a beautiful and amazing look!!! You are such a beautiful girl! I love the jacket and the belt!Really nicely put together. That vest is beyond adorable! Love it! aw, everything looks like so much fun! and you are gorgeous girl! love the vest!! Estas preciosa...tu bolso es ideal!! muchas gracias por comentar en mi blog. Cute photos and blog! Love that cute vest! Nice look !! Your sunnys are amazing ! love your glasses! chic and comfy look too! you look so cute! i love your boots! My son loves to ride on a carousel. che bello qui da te...ti seguirò!!!! So many lovely comment, thank you!!!! I love this outfit :-) I'm following you now :-) would you follw me too? by the way, I really like your vest, is so cute :) and will match with every color. Love the vest! This looks like such a great chic and comfortable outfit. I've added you to google friends - hope you'll do the same! Adoro i luna park anche se ultimamente quello che viene nella mia città a fine estate sta diventando un pò squallido... peccato! La giostra tipo carosello è magnifica, ho sempre voluto averne una... magari chissà, in futuro. Gorgeous!! Those sunglasses look great on you! !